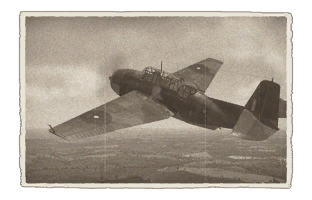 The ▄Avenger Mk II is a Rank II British dive bomber with a battle rating of 2.3 (AB), 3.0 (RB), and 2.7 (SB). 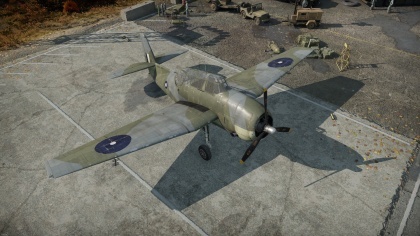 This aircraft was introduced in Update 1.39 as the Avenger Mk.I before it was renamed in Update 1.65 "Way of the Samurai". The Avenger Mk II is a British variant of the American Grumman TBF-1 Avenger licensed to General Motors to build as a TBM-1. 6.35 mm Steel plate in the nose. 12.7 mm Steel plate in dorsal gunner's seat. 40 mm Bulletproof glass in front of dorsal gunner. 12.7 mm Steel plate in front of ventral gunner. 6.35 mm Steel plate under the ventral gunner. 0.1 mm Wood connecting ventral gunner's armour. The Avenger Mk II (Great Britain) can be outfitted with the following ordinance"
The Avenger Mk II offers two 12.7mm machine guns with a combined total of 1200 rounds (one in each wing) ideal for strafing ground vehicles and fortifications. It also offers, another additional 12.7mm machine gun in the ball turret. It has 400 rounds, and is very capable of taking down pursuing forces. In the rear belly, of the plane it features a 7.62mm machine gun. This has 500 rounds of ammo. Fly low and fast, head towards your target drop your ordinance and bug out. However, If there are no hostile fighters, in the area. Destroy some enemy ground installations. E.g. AA, light vehicles, landing crafts and anti-tank positions. All modifications and improvements are unlocked and purchased when bought. Adaptive secondary ordinance for different maps e.g. naval and ground based operations. Very good vision in cockpit. Limited bomb selection for a bomber. The Avenger Mk II is a British variant of the American Grumman TBF-1 Avenger. Only 402 where given to British, under the lend lease program. It was internally designated by Grumman as the TBF-1B. The British once they received them, initially designated it the Tarpon TR.Mk 1. Then later on, it was re-designated as the Avenger. The Avenger is a single engine monoplane. It consists of, a three man crew. It’s primarily role, was a torpedo bomber. However, could also be used as an ordinary bomber. Only difference between the, Avenger to the US TBF-1 versions is: The installation of British oxygen systems and gun sights. Avengers were first assigned to HMS Victorious in 1943; -832 squadron 1 and later on to serve in 845 squadron 1. They where supplied from, January through to February 1943 to British government. Then the Majority of these planes where returned to the U.S. Navy in June 1943.